The claim: Norway, using its "right of reservation", has refused to implement the EU's Postal Services Directive. Nick Boles is one of the cross-party group of MPs that has been promoting the idea of Common Market 2.0, otherwise known as Norway plus, as a model for the UK's future relationship with the European Union, after Brexit. It was one of the alternatives to Theresa May's Brexit plan considered as part of the indicative votes process in Parliament on Wednesday, when it was defeated by 283 votes to 188. Norway, along with Iceland and Liechtenstein, is a member of the European Economic Area (EEA), but not of the EU itself. EEA members are part of the EU's single market. Asked about this in Parliament on Wednesday, Mr Boles told the House: "There is an absolutely crucial process for EEA members called the EEA joint committee. "All new rules passed under single market legislation are referred to that committee and members of the EEA have a right of reservation, which means that the postal directive, for instance, has still never been implemented by Norway because they don't like it and they just say no." "Although this 'safety valve' provision has never been used, Norway has considered invoking it a number of times and, legally speaking, there is no doubt that it can be used," Liv Monica Stubholt, partner at the Norwegian law firm Selmer, told Reality Check. "While it's clear that states do have the right to opt out of new laws, the political costs for using it are considered to be potentially quite high, which is why it hasn't yet been used," Hanne Zimmer, from the Norwegian law firm Wikborg Rein, told Reality Check. 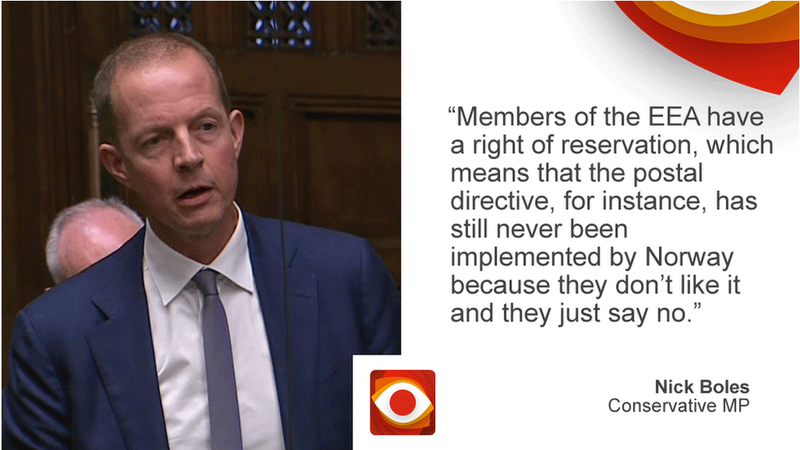 Mr Boles told Reality Check: "I wasn't aware that Norway had ultimately accepted the postal directive but the broader point about the right of reservation still stands." In addition to the right of reservation to completely opt out, EEA members can also negotiate adaptations to new EU rules. While most of these are minor, technical points, there are a few examples of more significant changes, such as Norway's exemption from implementing EU rules on emergency exits in certain tunnels. "Such examples are relatively rare, and the EU is generally reluctant to grant them except in very specific circumstances," Hanne Zimmer said.